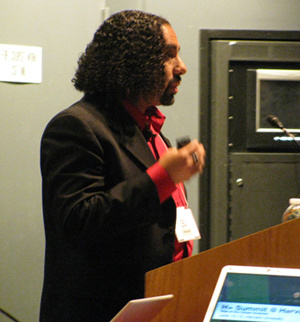 Ramez Naam is up now, outlining his vision of "The Next 10 Years of Human Development." (Bio, slides, on-the-fly transcript.) Naam is the author of the 2005 book More Than Human: Embracing the Promise of Biological Enhancement, which Charles Rubin reviewed in The New Atlantis here. Naam names various human limitations and defects that scientists are now trying to transcend, and says that incorporating these potential enhancements within the realm of medicine "is good for transhumanists in that correcting these deficits is considered medically legitimate." In other words, he wants to bypass the moral questions such research raises, instead protecting the research through P.R. and strategic positioning: who cares what it all means, how can we make sure the public lets us do it? Naam is right, of course, that the line between therapy and enhancement is blurry; that is a point eloquently made by Leon Kass in his New Atlantis essay "Ageless Bodies, Happy Souls," and it was a major theme of the President's Council on Bioethics report Beyond Therapy. But we can certainly still recognize a distinction — indeed, Naam's presentation presupposes a difference between the two, otherwise he would have no reason to argue that we should hide enhancement within the realm of therapy. Naam continues by running through the current state of knowledge about genetics and genomics, describing the genome as "digital," and asking "If the genome is digital, can we edit it?" (This is a common metaphor, and a profoundly inadequate one, as the burgeoning science of epigenetics makes clear.) He then describes briefly how we'll supposedly soon be able to order up embryos made-to-order with a specified genome: the arrival of "designer babies." 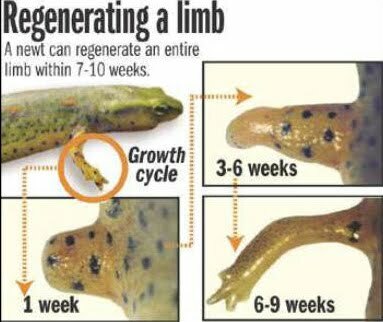 After that, he says, the next step will be incorporating into human beings elements of non-human genomes — and he shows a slide of a newt regrowing a limb (shown at right). Nothing much new in this talk, though that's probably not Naam's fault. The presenters are really rushing and aren't able to fit much into these crammed time slots. *UPDATE: Naam tells me I did indeed mishear his point. I think I was attempting to summarize his point and did so poorly. Judge for yourself: the on-the-fly transcript is here, with the part in question beginning with the third paragraph.